Baking Christmas cookies is one of the traditions that can really quickly spin out of control. I know from experience. ;) I start making a batch with the kids, and then I see a cute idea and add that cookie in. Then I remember an old family tradition I decided to make as well. Before you know it we are 7 batches in and we are never going to be done making cookies. Some years I go to the other extreme and commit to just making one kind of cookie, then my cookie plates look a little sad as a result. This year, I think I finally figured out the perfect solution. I am sticking to a cookie plan that only involves 3 recipes, that are all in pretty shades of reds so the cookie plate will look amazing, the cookie making will remain under control, and the mixture of tastes will make everyone thrilled. The idea could be re-purposed into any color scheme, just find 3 recipes that will look awesome together and have a good variation of taste. Here is my 3 shades of red cookie plan for 2015. It’s going to be a sweet one! I remember making kiss cookies my entire life. Normally we do the peanut butter/chocolate kiss kind (they are my favorite! 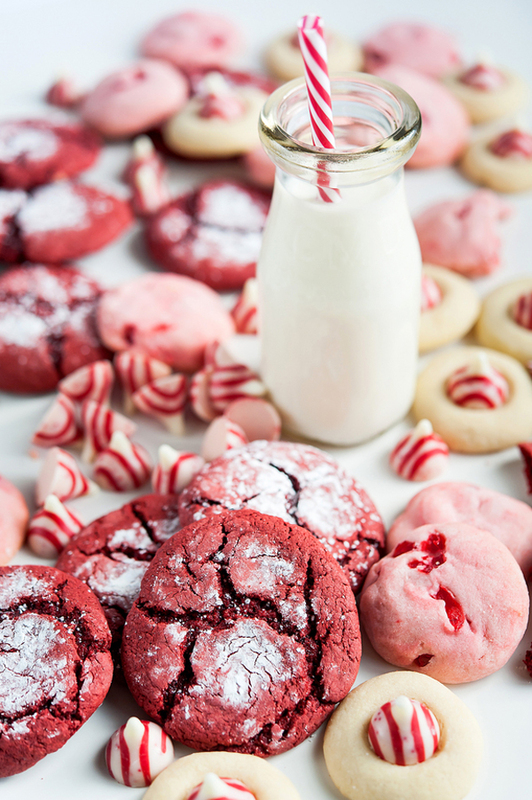 ), but this year I’m switching it up to stick with my red cookie theme and making them with a peppermint twist! 2. Cream the butter and the sugar, peppermint extract, vanilla and egg. 3. Mix the baking soda, baking powder and flour in a separate bowl. 4. Add the dry ingredients to the wet until the cookie dough is a consistency that can be easily rolled into smooth balls. 4. Place rolled balls on a baking sheet lined with parchment paper. 5. Bake the cookies at 350 degrees 7-9 minutes until the bottom of the cookies are lightly golden. 6. 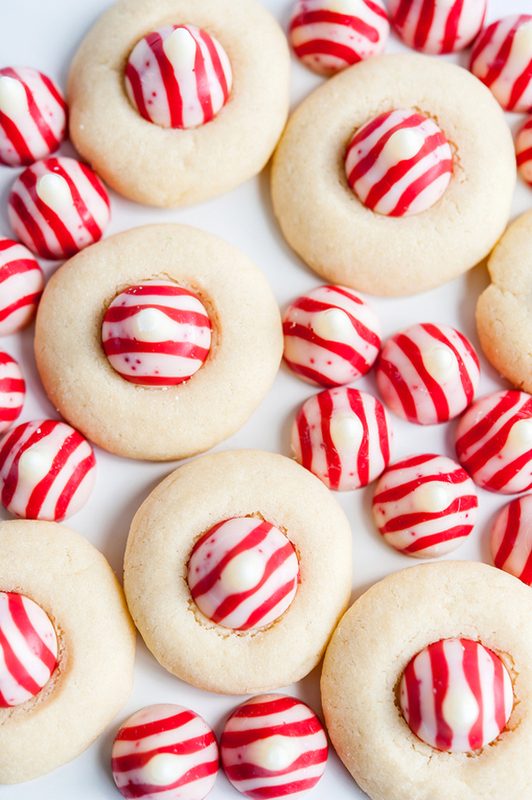 While the cookies bake, remove the wrapper from the peppermint kisses. 7. Remove the pan from the oven and immediately press a kiss into the center of each cookie. 8. Place freshly pressed cookies in the freezer for a quick 5 minutes to set the cookie. Allow to finish cooling on a wire rack. To add a pretty pink shade to the cookie plate, a cheery cookie will do perfectly. The cherry cookies not only brighten up the display, but they also give a fresh taste to balance out the richness of the other two cookies. 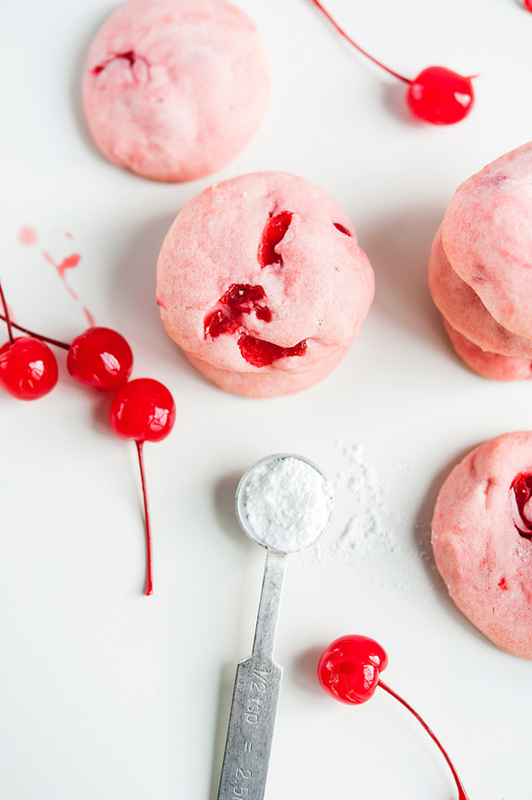 The best way to make these is to brandy your own cherries a couple weeks ahead, but the store bought variety will work too for the busy Christmas season. Beat the butter, sugar, vanilla and almond extract together. Mix in the cheery juice and beat until combined. Add the flour and mix well to form the dough. Add in the chopped cherries and hand stir gently until they are well mixed in. Wrap the dough in plastic wrap and chill for at least 4 hours in the fridge. Preheat oven to 350 degrees and line baking dishes with parchment paper. Roll the dough into 1 tablespoon balls and place on baking plans. 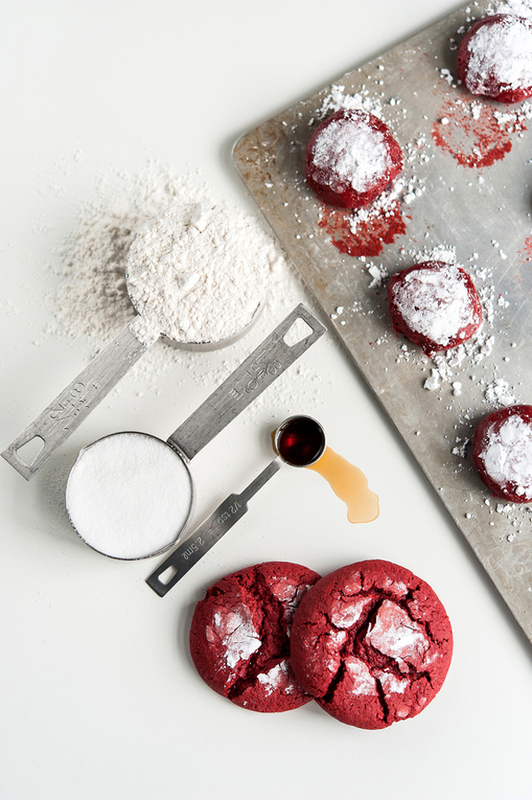 These red velvet cookies are possibly the easiest cookies to make ever. I know that technically since they used boxed ingredients they are not “cookies from scratch”, but I promise the texture on the cookies will have you making them over and over again. Isn’t the color just perfect for the Christmas season? 2. Combine the cake mix with, the package of cream cheese, 1 egg and 1/3 cup vegetable oil using a hand blender. 3. Form teaspoon sized balls and place on a lightly greased cookie sheet or baking pan about one inch (1″) apart. Slightly pat down the top of each cookie ball. 4. Cook for 8-10 minutes. The tops of the cookies will crack when they are ready. 5. While hot, lightly sprinkle the top of the cookie with powdered sugar. Enjoy putting the cookies out together, wrap some up to give away, and save a couple plates for home. Start a new color clad sweet holiday tradition this year.